Just steps away from the Ransom Center is The University of Texas at Austin School of Architecture, where hundreds of students work diligently on a wide range of design assignments, from the scale of furniture and interiors to that of cities and regions. These assignments are often based on real-life scenarios, providing practical experience to prepare students for their professional careers. This past semester, the Ransom Center’s planned exhibition on the Arts and Crafts movement—scheduled to open in spring 2019—served as the focus for a semester-long advanced interior design studio. 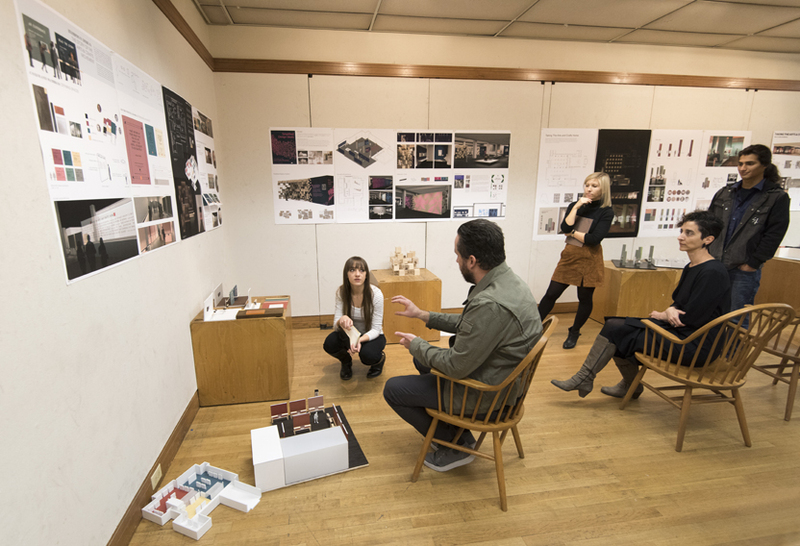 The studio, led by Associate Professor and Director of the Interior Design Program Tamie Glass, engaged students in several aspects of exhibition design. Between assignments, students attended a series of lectures by professionals in the fields of lighting and graphic design, historical color research, and interactive technologies, as well as lectures and tours by Ransom Center staff and the exhibition’s curators, Christopher Long and Monica Penick. Students discuss their design projects during the studio. Photo by Pete Smith. As a result, students balanced their exploration into concepts for twenty-first-century exhibition design against the specific parameters of the exhibition project at the Ransom Center, from its objects and narrative to the Center’s gallery space. For example, students grappled with the challenge of how to evoke a period through color and graphics while maintaining a sense of interpretive distance; how to create engaging display systems without overwhelming the original objects; and how to engage broad audiences with the exhibition through accessible digital and physical spaces. Because the studio took place relatively early in the exhibition’s planning stages, it offered a learning opportunity for students as well as for the exhibition planning team, who were likewise engaged with these questions. The studio created a forum where ideas and approaches for the exhibition could be proposed, tested, and discovered. Like many other studios offered by the School of Architecture, the course resulted in multiple compelling design solutions, each approaching the project in different ways. Below, two students share their design concept and reflect on their experience with the exhibition project. I began my design process with a period of user research, by interviewing visitors to the Center’s Mexico Modern exhibition. After discovering that visitors most enjoyed learning about the characters behind the objects on display, I distilled this finding into my “narrative table” strategy, which groups objects related to one character or actor from the Arts and Crafts movement on one display table. 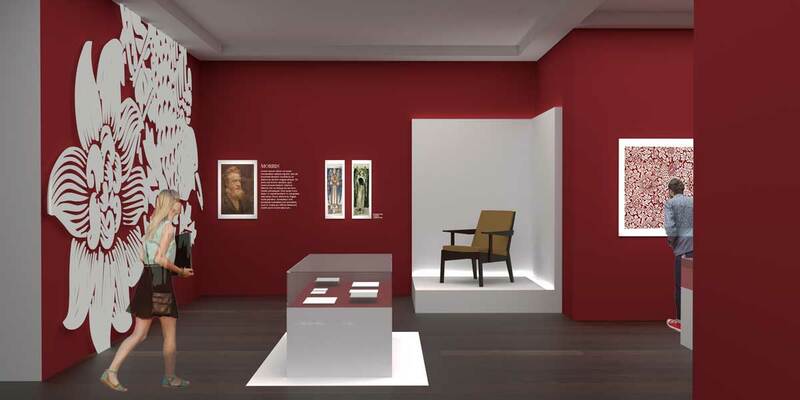 This way, each table tells a complete narrative within the larger story of the exhibition. Aesthetically, I wanted to give a nod to the familiar domestic environment that resulted from the movement while also responding to the context of the museum. 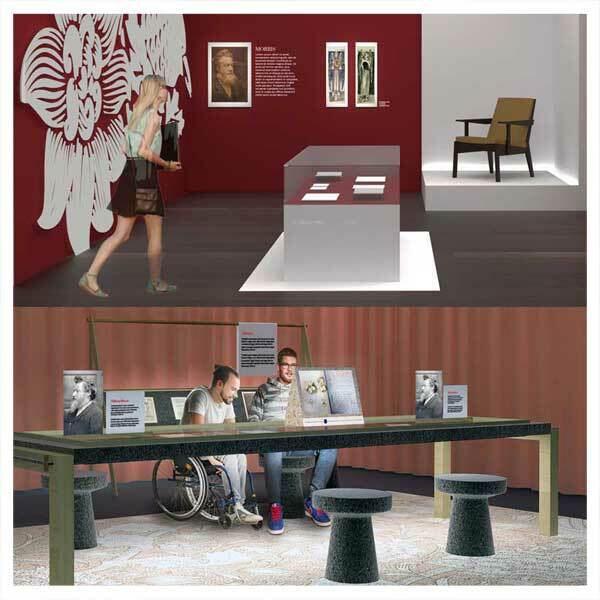 The table is low to the ground and surrounded by stools, encouraging visitors to spend some time with the objects and to engage in conversation as they might around a dining table. My experience with this studio reminds me how important visitor research is in the exhibition design process. When a designer has an accurate idea of the visitor and their needs, they can design a rich and meaningful experience that engages all types of learning styles. 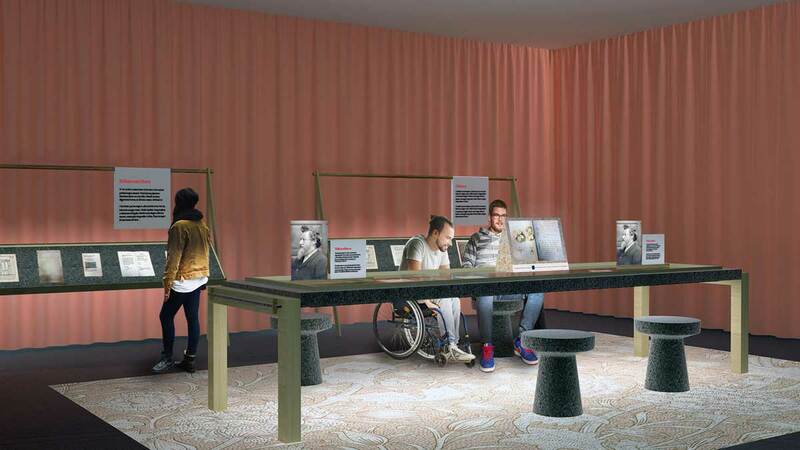 Although the idea of a table with chairs is a simple one, it is steeped in an understanding of the Center’s visitors. The goal of my design system is to provide an exciting way to highlight and display objects without distracting from their inherent interest. Large graphics and color were used in this design in order to orient visitors throughout the exhibition. These graphics hint at the time period of each exhibition section, showing an evolution from organic to geometric to architectural forms. This use of color and graphics creates a wayfinding system as well as a backdrop, while allowing the objects to be displayed within the voids of color. This studio helped to inform my design process. By looking deeper into the design of exhibit spaces and studying the objects being displayed, I gained an understanding of how to allow those pieces to be the focus of (without competing with) an equally exciting design concept. Ground coordinates the Ransom Center's research fellowship program and assists with the planning and implementation of other academic programs, including the biennial Flair Symposium. She is also a graduate student in the School of Architecture at The University of Texas at Austin, focusing on architectural history and its representation in museums and archives. Such an excellent project – I was so delighted to be brought on by Tamie Glass, as a color consultant with insights behind the powerful aesthetic of William Morris. Great to see the strong work and creative ideas unfold!